Sinn Fein has been accused of sending out the signal to dissident republicans that “their actions are justified” by appearing to have “withdrawn” its condemnation of last Saturday’s car bombing in Londonderry. Unionists have heaped criticism on the party, with DUP MP Gregory Campbell saying it is sending “mixed messages” over the attack, and that when it comes to violence and peace Sinn Fein is still trying to “straddle both sides of the fence”. It comes after Derry City and Strabane District Council only just managed to pass a motion on Thursday condemning the bombing, in the face of Sinn Fein opposition. The party initially issued a statement last week saying it “condemned” the explosion, and yesterday regional leader Michelle O’Neill joined Foyle MP Elisha McCallion (below, left and right respectively) at an anti-violence protest in the city. But when it comes to the council vote, DUP Foyle MLA Middleton said Sinn Fein’s failure to condemn all violence “does nothing but send a message to those involved in dissident activity that their actions are justified” – adding there are “big questions” for the party leadership. Sinn Fein meanwhile accused rivals of trying to “play politics”. 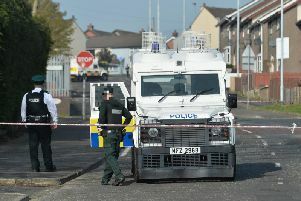 Sinn Fein had proposed a motion at a full council meeting on Thursday which spoke of the need to “oppose” the attack. The Sinn Fein councillor who proposed it, Sandra Duffy, said she had hoped to achieve a unanimous vote by using the word ‘oppose’ rather than ‘condemn’ (meaning that it might have made it acceptable even to hardline independent republicans on the council). Independent nationalist Sean Carr, formerly of the SDLP, said the Sinn Fein motion was “very weak”, and so instead tabled an amendment clearly condemning the bomb – as well as all past violence. Sinn Fein opposed this (alongside a number of independent republican councillors, who comprise a voting block of four on the council) with the result that it only narrowly scraped through, 19 to 18, thanks to the casting vote of the city’s SDLP mayor. Independent councillors Gary Donnelly and Paul Gallagher had already declined to condemn the car bomb attack when invited to do so by the News Letter earlier this week. Sinn Fein’s Northern Ireland leader Michelle O’Neill yesterday attended a rally organised by trade union leaders to oppose “all paramilitarism” in light of the bomb blast outside Londonderry’s Bishop Street courthouse on Saturday, which police believe was the work of “the New IRA”. The rally drew an estimated 100-or-so people according to the Press Association. Alongside Ms O’Neill at the rally was Elisha McCallion. Just days earlier Ms McCallion had been asked on BBC Radio Foyle if she would echo the words of her “inspiration” Martin McGuinness, who famously said violent dissidents are “traitors” to Ireland. She shied away from the question, instead describing them as having “no mandate”. The DUP group leader on the council, David Ramsey, said: “Something I said last weekend that the only positive coming out of all this was the unity in condemning what has happened. But now Sinn Fein seem to have withdrawn from that.